Papercrafts by Patti: Sneak Peek and Where's The Cable? Sneak Peek and Where's The Cable? Hi! I wanted to give you more than a sneak peek of tomorrow's PPA card, but I can't find the cable that helps me upload photos from my camera to my computer! So sorry! I will try and update the post later or do a whole another one today. Until then, here is my sneak peek! 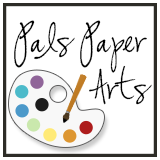 Be sure and visit back tomorrow to see all of the Design Team offerings for the latest Pals Paper Arts Challenge, and then play along! If I had to rely on my cable to upload photos, I would be sunk! Thankfully my laptop has a card reader so I can easily share photos when my cable goes MIA. Love the colors of the sneak, can't wait to see the full reveal! You sound like me. Only, I'm better at taking the camera with me and leaving the card in the slot in the printer! I love what I see so far! I can't wait to see the entire card!